Posted byD Needlestone	 June 3, 2016 June 3, 2016 Leave a comment on Why do people get so angry about children learning with technology? 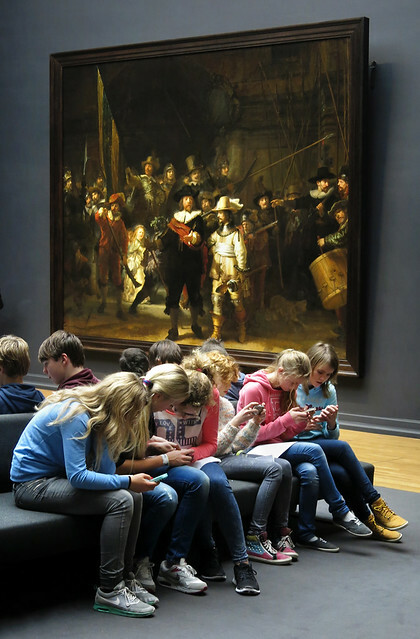 A picture popped up on my Facebook feed today which has been nicknamed the “viral Rembrandt kids on phones photo”. So I’m biased because my specialism is integrating education and technology but from my perspective this picture shows two things. One how little most people know about learning and the school system we have today. Two how quick people are to react on social media. For me this picture says “WOW”. Because too many kids are stuck in old fashioned school classrooms where they never go out of the classroom and only learn facts from textbooks and blackboards. The kids in the photos have been taken to an art gallery, that is a big thing in itself, art is one the subjects, in many countries, that is always under pressure because it is not a “business skill”. So these kids are out of the classroom despite the bureaucracy and cost hurdles (and they can be big), big thumbs up from me, and at an art gallery – wow their teacher is making them learn about art! Now when I was at school we took trips to museums and galleries and let’s be honest, often the highlight was the gift shop! Sometimes we got a good tour guide and we learnt along the way but not always. As an adult I visit art galleries and have done across the world but what I get out of the visit varies as I am far from an expert. The world renowned Uffizi gallery in Florence, also renowned for the length of the queue to enter, was an underwhelming and unexciting experience for me when I visited as a 21 year old. These kids are not just at a gallery but so engaged with their learning (via mobile phones) that they don’t even look at the photographer. A quick comment on technology in the classroom. I don’t believe kids should be on their phones all the time but overall I think it is pretty rare for kids to use phones in school for learning. Of course I understand that when in a room with a masterpiece it is a shame to not look at it but it is also a shame to not learn about it. The balance is the key! There may be a problem that kids spend too much of their free time on technology, but I think they could and should spend more time at school using technology, where it brings benefit and engagement. And remember the school system most countries use is a slowly developing archaic model built to train students to be skilled to do jobs from the last century. And my comment to the quick, judgmental and damning reaction on social media? Mobile phones and technology are here to stay as a part of our everyday lives. You might not like it but it’s a fact and you are reading this on your PC/phone right now. We need adults to lead the way to show kids when to be on their phone and when not. Let’s face it, most adults don’t do this very well. So before you criticise the kids think about the example and training we are giving them.